WELCOME!! You have found your way onto this page because you are a MAKEUP DIVA and proud of it! My name is Natasha Gross and I'd like to welcome you to my blog. My post are about the latest makeup trends, my favorite makeup products and break down of makeup looks I do. If you would like to receive updates about ONLYFORMAKEUPDIVAS add your email below. I look foward to your feedback! It's okay if you fake it, everyone does!!! Living in Miami you realize that almost everyone walks around bronzed and beautiful. Not every one's schedule allows them to lay on the beach all day so why not fake it? We are not talking about spray tans that smell horrible and leave streaks but by a simple bronzing lotion. This Bronzer gives off a deep shimmer with a gorgeous golden hue! NARS most popular face Bronzer is Laguna, so i was super excited to see they made this into a bronzing lotion. 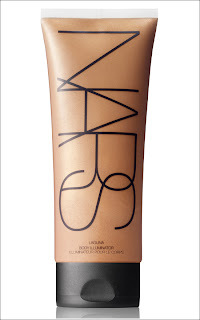 This is NARS original body oil/bronzer. 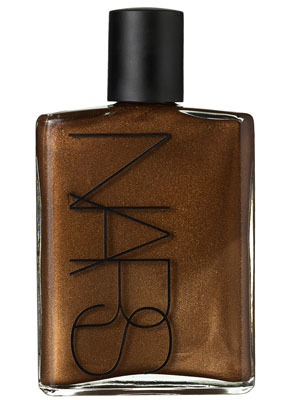 It leaves your skin looking super moist with a slight shimmer. In comparison to the LAGUNA BRONZER, this one does not give off as much color and shimmer. I ABSOLUTELY love this bronzing makeup. You will have a great beachy, coconut smell all day. Not as dark as the LAGUNA bronzer but still does the job. You don't always have to splurge on these pricier products to get that BRONZE LOOK. Sally Hansens' spray bronzers are great. They give you the color minus the shimmer. With the variety of colors they make, you will not have a tough time finding the one that is right for you. Pocket Rocket for your LIPS...Mmmmmmm... I think I'm in LOVE!! Besides Angelina's Leg, these are other looks I loved on the Red Carpet! #PHUCKYO BLACK EYELINER, TRY A POP OF COLOR! The new MAC collection is FIERCE!! CHECK IT OUT!! R&B singer ASHANTI is BRINGING IT in her new video! Kim Kardashian... Everyone loves her makeup look! Want to know why? Once you go BLACK you always go BACK! but before you do try out this GRAY EYELINER! Click Here to know "WHATS GOING ON"
NatashaGross NGMakeupArtistry.com. Ethereal theme. Powered by Blogger.